The Ruck Life » Skydiving! Skydiving rocks! Except for those first 45 seconds of ear shattering pain during freefall. The gliding down after freefall was the best part. 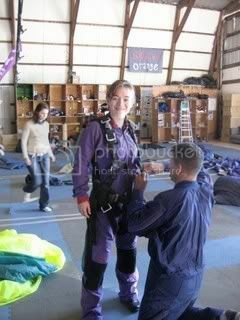 O, and the intial jump out of the plane was sweet too. Being as it was a tandum jump, I just had to hang on for the ride. I’m going to do one more tandum with an emphasis on Accelrated Freefall before I finally jump on my own. The freakiest thing was, it was my tandum instructors first jump with a student. I really didn’t want to know that, but o well. I initially thought I would much rather have one of the other guys, but he turned out to be awesome. Even though I could tell he was a little nervous about me. All in all it rocked and I will definitly be going again in a few weeks. Thanks so much for including me in the “Ruck Blog”. I ask about you and wonder how you both are doing. It looks as though you are enjoying your work and each other and life in general. That is how it should be. Learning a little something new about each other is exciting and by reading this I’m learning more about the two of you. I love Washington, DC–in fact I wish I had sought employment there in my youth. It is an intriguing city and I always love the feel of the city when I’m there. I will be there Dec. 4-7 for the Keep America Beautiful conference at the Omni Shoreham Hotel @ 2500 Calvert St NW. Good luck to the both of you and I look forwarding to seeing more of your adventures.